In the late eleventh and early twelfth centuries, the ancient pueblo sites of Aztec and Salmon in the Middle San Juan region rapidly emerged as population and political centers during the closing stages of Chaco’s ascendancy. Some archaeologists have attributed the development of these centers to migration and colonization by people from Chaco Canyon. Others have suggested that the so-called Chacoan 'system' was largely the result of emulation of Chacoan characteristics by local groups in outlying areas. Research over the last five years in the Middle San Juan suggests that both of these processes were operating. Work by two groups of contributors resulted in this synthetic volume, which interprets thirty-five years of research at Salmon Ruins. 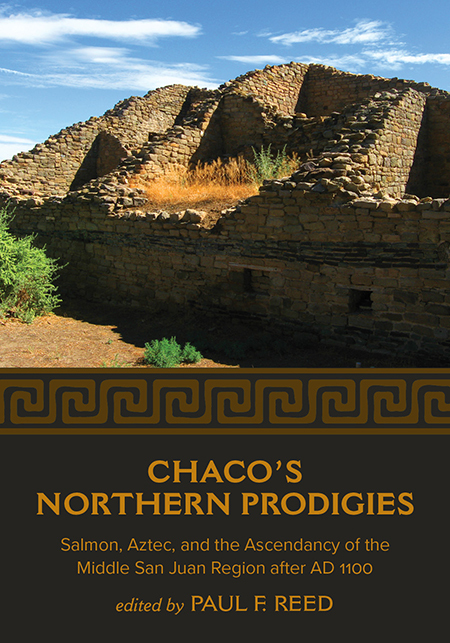 Chaco’s Northern Prodigies also puts recent work at Salmon Ruins in the context of Middle San Juan archaeological research. It is a timely synopsis of the archaeology of this region of the Southwest. Paul F. Reed is a preservation archaeologist with the Tucson based Center for Desert Archaeology. He is the author of The Puebloan Society of Chaco Canyon and the editor of Foundations of Anasazi Culture (University of Utah Press, 2000). 12. Animas Anamnesis: Aztec Ruins or Anasazi Capital?